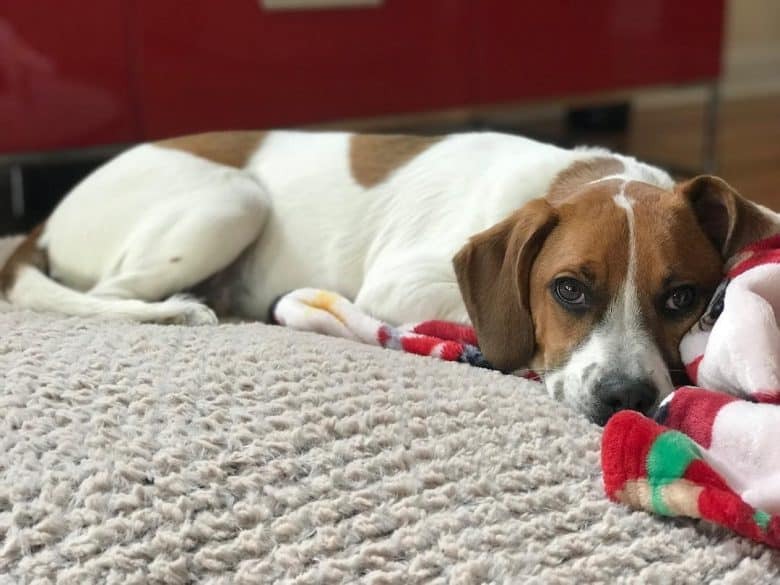 The Boggle dog (also called the Bogel, Boxel, Bogle, Beagle Box) is a crossbreed with strong, athletic features and a fun-loving, active, and sunny personality. The first-generation cross between a Boxer and a Beagle, the Bogel is generally known as a lively and cheerful dog with a bit of rambunctiousness on the side. They are great companion dogs for both beginner and experienced dog owners alike and are excellent pets for the family. Let’s find out more about this crossbreed and why it is one of the most sought-after dogs today. Is the Boxer-Beagle crossbreed officially recognized? What does a Boxer Beagle mix look like? How big do Boxer Beagle mixes get? Does the Beagle and Boxer mix have a thick coat? 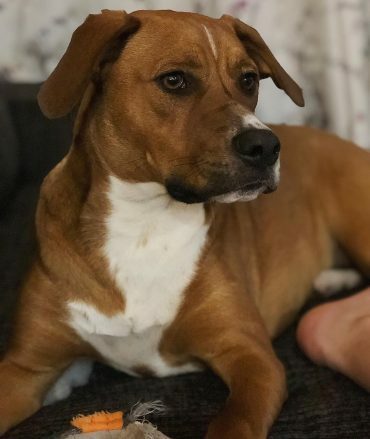 Are Boxer Beagle mix good dogs? Is the Boxer Beagle mix a barker? How much grooming does a Boxer Beagle mix need? 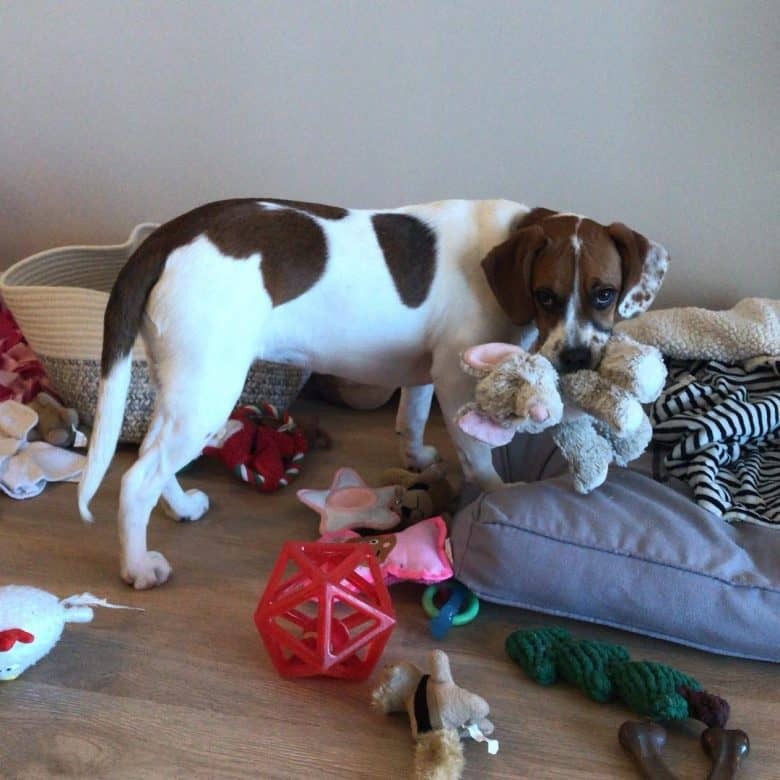 How much activity does the Boxer Beagle mix need? 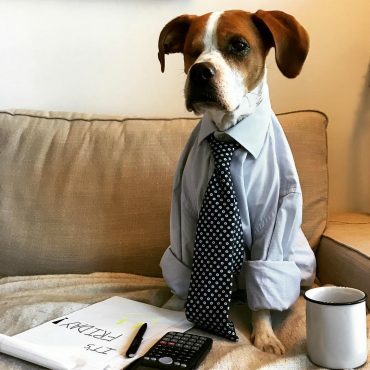 How much will it cost to own a Boxer Beagle mix? Is the Boggle the right dog for you? 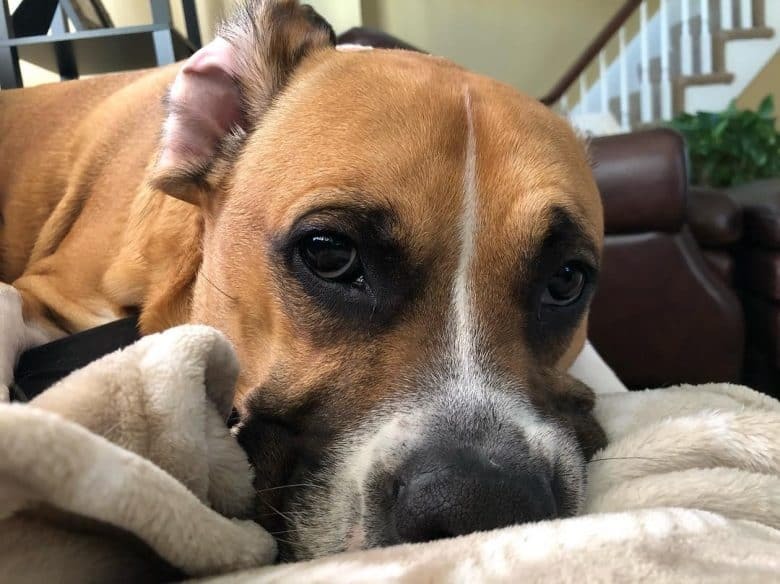 Raring to own a Boxer Beagle mix? The Boggle originated during the 2000s in the USA and has since become quite popular among dog lovers because of its delightful personality and unique body structure. He is known as a designer dog, which are the offspring of two purebreds. Beagle and Boxer mixes are mostly first-generation crossbreeds. The idea behind crossbreeding stemmed from a desire to take the most appealing characteristics from each purebred parent and produce an ideal pup from the combination. The Boggle gathered the best of both worlds when it comes to his parents’ personality and characteristics. This crossbreed combines the muscular body of the Boxer and the good familial instinct and the unique, strong sense of smell of the Beagle. That being said, let’s take a look at the origin of the Boxer Beagle mix in light of its parentage. We can trace the origin of the Beagle to 5th-century Greece, where it was used for hunting small game. William the Conqueror brought the Beagle’s predecessor to England during the 11th century. The small hound later came to America with the help of General Richard Rowett in 1884 and became popular among game hunters as well as families. There are also theories that state that the Beagle’s name originated from begueule, a French word meaning “gaped throat,” which perfectly describes the howling sound this canine makes. Beagles remain well-loved pets even today. In 2017, these hounds held the 6th spot out of 190 on the American Kennel Club’s list of most popular breeds. The Boxer came from the Tibetan line of Mastiffs, the extinct German Bullenbeissers, during the 1600s in Germany. These charming canines got their name because of the way they use their paws whenever they jump, play, or fight. They were first seen in Munich in 1895 and came to the US in the early 1900s. 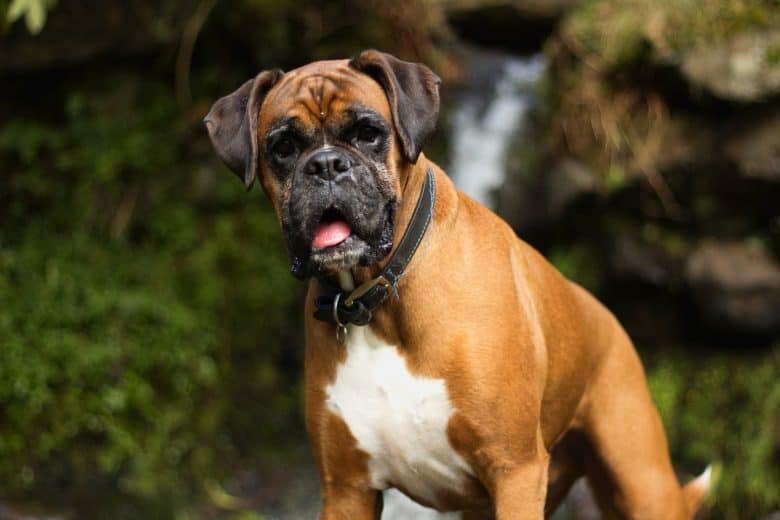 In 1904, the Boxer was recognized and registered in the American Kennel Club. The breed held the 11th spot out of 190 on AKC’s list of most popular dog breeds for 2017. This crossbreed is one of the most sought-after and popular dogs to date, so it has been recognized by different dog clubs. The Boggle dog has competitive registration under the American Canine Hybrid Club (ACHC), Designer Dogs Kennel Club (DDKC), Dog Registry of America (DRA), as well as the International Designer Canine Registry (IDCR). The Boxer Beagle mix has physical features that hint at both its Beagle and Boxer ancestries. They are an energetic, athletic breed with a muscular, medium-sized built. 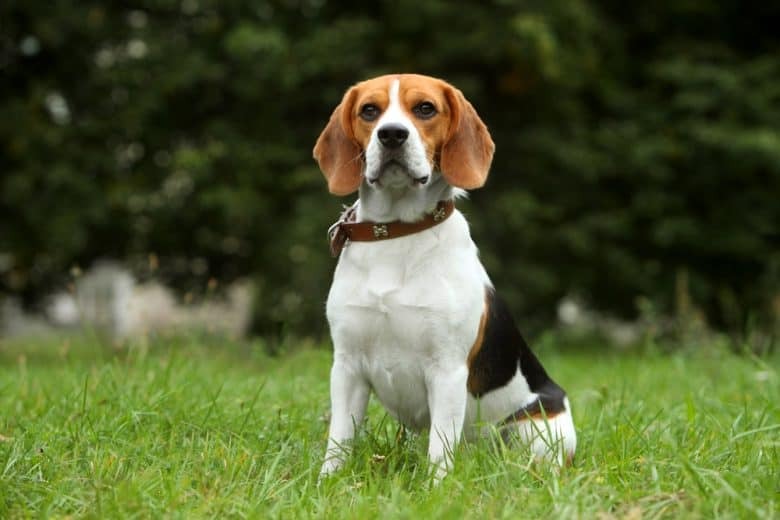 Most Boggles have an elongated body with a balanced posture, a large chest, short, muscular legs, and a long tail reminiscent of the Beagle’s. They may have a square-shaped, wide head and a shorter muzzle like the Beagle, or a thinner and longer face like the Boxer. Some Bogels have hanging jowls, drooping ears, and wide, round eyes of hazel to brown; all of these features make the Boggle’s face resemble the Beagle’s expression. 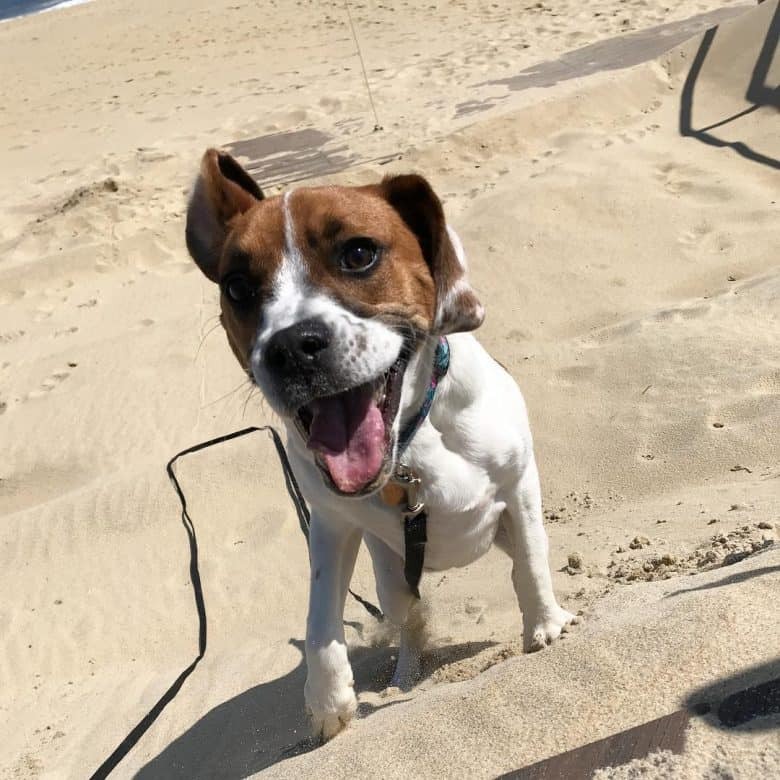 A full grown Boxer Beagle mix stands between 13 to 30 inches (33 to 76 cm) in height and weighs around 20 to 80 pounds (9 to 36 kg) on average. Boggles are well-built dogs, with a consistent muscular formation. They are perfect companions for people looking for a reliable and active pet. Neither the Boxer nor the Beagle has a thick coat, so the Bogel is unlikely to have this feature. The coat of a Beagle Box tends to be sleek, short, and smooth, with a dense texture. Colors vary from parti/tricolor, black, white, tan, brown, fawn, black and tan, brown and black, and black and white. When it comes to its temperament, the Boggle has a good mix of the personalities of the Beagle and the Boxer. These hybrids have a high sense of loyalty towards their family, so expect the Bogle to stick to your side whenever possible. It has a friendly, gentle demeanor and enjoys being around a lot of people. You may discover that your Beagle-Boxer hybrid likes to jump on people as a greeting, but, with the right training, this habit can be nipped in the bud. Every dog breed possesses both good and bad traits, so it is essential to train your Bogle at a young age. Proper training will help it become a well-mannered member of the family. Some Boxels may be prone to aggressive behavior because of their Boxer ancestry. At a young age, Boggle dogs should be included in socialization opportunities to foster good relationships with all members of the family and to temper his restlessness and distrust of strangers. Boxer-Beagle hybrids tend to get along better with older children. For safety, younger kids need to be supervised when interacting with these dogs. These sweet crossbreeds should never be bothered when they are eating or sleeping. Boggles are also not tolerant of cats and will not hesitate to show it. Boxer-Beagle hybrids are occasional barkers, using their voice to warn you at the first sign of a stranger or intruder near your home. 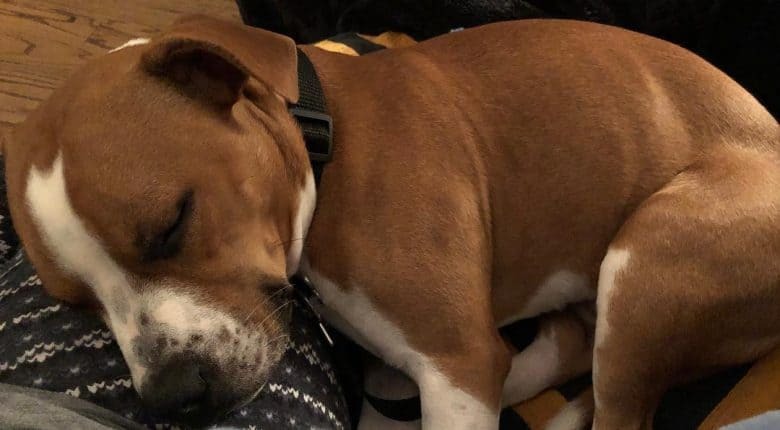 The Boxer Beagle mix can be protective when it comes to his owner or family. These dogs tend to be wary of strangers, making him an excellent watchdog. However, the Boggle will easily warm up to them the minute they know that the stranger is a friend. This Boggle dog is quite convenient to care for since he only needs a minimal amount of grooming. When it comes to shedding, the Boxer Beagle mix has a coat that sheds moderate to low amounts of fur. Winter is when they shed the most. The Beagle Boxer mix’s coat requires weekly brushing to remove dead hairs. Bathing is required only when needed, as frequent baths will strip the Boggle’s coat of natural oils. Make sure to use a dog shampoo for sensitive skin. You can use a wet towel to rub down your Boxel’s coat to keep him fresh in between baths. It is important to keep the Boggle’s ears dry and clean after baths. Their ears need to be cleaned weekly to avoid ear infections. Nails should be trimmed monthly. You can either do the trimming yourself or have a pet groomer do it for you. Brush the Boggle’s teeth two to three times a week. You should also introducing your Boxer-Beagle puppy to proper grooming at a young age, so you won’t have problems keeping him clean as he grows up. Given the hunting background of their Beagle parents, Boggle dogs are known to be active crossbreeds, and their boundless energy might leave you breathless. This crossbreed enjoys playtime and is a great outdoors enthusiast. Boxer Beagles need 45 to 60 minutes of exercise daily, whether in the form of walks, jogs, or visits to the dog park. Canine sports like agility, flyball, and dock jumping helps them burn off their energy. Games like fetch and treasure hunts are good ways to keep him active and healthy. Your Box-a-Beagle will also benefit from playing with interactive dog toys to stimulate his mind. Given his great jumping abilities, the Beagle-Boxer hybrid would be safest in a fenced yard. Most Boggles are accomplished diggers, too, due to their Beagle parentage. Your best bet to keeping your Boxel puppy safely contained is to use a wireless fence for your yard. The Beagle Boxer mix is an intelligent dog, and training should begin the minute you bring your puppy home. This breed is easily trained, and, as long as you are calm and consistent, your Boggle will be receptive to your commands. You can start your training with fetch since he loves to run and chase after things and he is a natural when it comes to tracking. It is also essential that you house-train your puppy, so you won’t find ‘accidents’ all over the house. Training is a vital part of the life of such an active dog, and we cannot overemphasize the importance of teaching good behavior during their puppy stage. It is best to start the dog with obedience training. Make sure to keep your commands simple and consistent, so you don’t confuse your dog. Dogs respond well when their interest is stimulated and kept high at all times. You should employ a variety of training methods and combine them with rewards and praise. Positive reinforcement will produce better results, as the Boxer Beagle cross loves to please its owner. The Boggle does not respond well to harsh treatment. Firm but gentle correction will let your pup know that you mean business. As we’ve said before, socialization is just as important when you train your dog. Exposing him to new environments makes him more adaptable. Like Beagles, Boggles have issues with obesity, so careful monitoring of his food intake and weight should be considered. Before taking a Beagle-Boxer puppy home, make sure to ask the breeder for health clearances of the pup’s parents. Responsible breeders will have also done early health screening on your puppy to ensure that it’s in good health. The Boxer Beagle mix has an average life expectancy of 10 to 15 years. If properly taken care of, these dogs can enjoy longer and healthier lives with their families. Your dog should be fed just the right amount of food every day to keep him fit and trim. On average, Beagle-Boxer hybrids should eat 2 ½ to 3 cups of dry dog food daily, divided into two or three meals. Because of their high activity levels, Boggle dogs need a high-protein diet. High-quality sources of protein like fish, eggs, and raw meat will also strengthen the Boggle’s bones and joints. Make sure your dog’s diet has carbohydrates, such as brown rice and sweet potatoes, to keep his energy levels up. Consult your vet about the proper diet for your Beagle Box, just to be on the safe side. An average Boxer Beagle mix puppy costs around $300 to $700. Annual medical procedures may cost between $485 to $585, and these expenses include neutering, microchipping, deworming, blood tests, and vaccinations. Annual non-medical costs for collars, leashes, crates, training, and food usually amount to around $600. A few websites to consider are Greenfield Puppies, Lancaster Puppies, and Petland. If you would rather adopt or rescue a Boxer Beagle mix, try some of these websites: Puppy Finder, A Forever Home, and Adopt-A-Pet. Be wise in choosing where to purchase a Boggle puppy. Always do your homework and find out if the seller is a legitimate breeder. 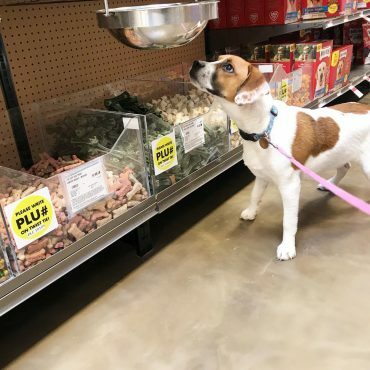 Here’s a checklist to use when choosing a reputable Boxer Beagle mix breeder to trust. He allows you to see the puppies with their mother. The dogs should be raised in a clean, safe environment. The breeder has a good reputation online. The breeder should be able to give you references from his previous customers. He has taken the time to properly socialize the pups, who should not be excessively shy around strangers. He asks you as many questions as they can in the same way that you do, since a responsible breeder makes sure that their puppies are going to good owners. You should always make sure that your lifestyle matches the personality of the dog you want. The Boggle loves the outdoors and has high energy levels, so he is a good match for an active owner. Boxer-Beagle mixes need a spacious environment where they can freely roam around and play. The Boggle is a playful canine who can provide hours of amusement and joy to its owner. However, they require an owner with a strong personality and who’s capable of being a good leader for them, especially when it comes to training. Otherwise, they will have a cranky disposition and may display bouts of aggression with people and other animals. Another thing to keep in mind is that this crossbreed is more suitable for families with older kids. The Boggle may become aggressive with younger kids who are too curious. The Boggle dog is one of the most exciting breeds that you can find. You should get this breed if you want a dog that is loyal to your family. Playful and affectionate, this lovable mutt will be a lifetime companion to you and your family. The Boggle maybe a handful at times, but he definitely expresses his abundance of energy in positive and amusing ways. They have tendencies to jump around people and chase other animals, so keep him on a leash when outside. Have you fallen in love with the Beagle Boxer mix? Maybe you’ve had the chance to care for such a fantastic dog. Whatever your experiences may be, feel free to share them with us in the comments below!